We seem to have bud burst early & mostly in our Meryic with 20% of those to the hands in prayer stage. Rex are a little slower. I don’t know what has brought on this early bud burst but we have had some good frosts & also a month ago had over 300 mm of rain over 2 weeks; All in all a strange winter. I am hoping for a reasonably dry summer, as I don’t mind irrigating as opposed to having trees die due to drowning! Once again thanks for your info. The bud on the left would be at the right stage for spraying. 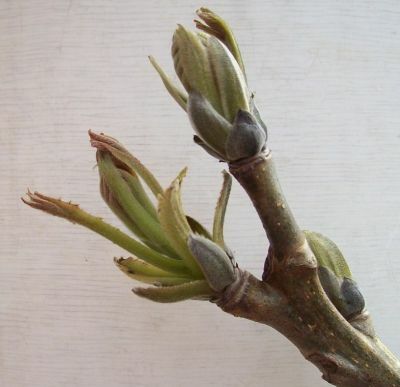 Obviously buds develop at different times on the tree, and trees even of the same variety will develop at slightly different times. [..snip. With the provision of better instructions, you will have discovered you need just the current NZTCA password to read walnut blogletters (apart from the initial blogletter which is not password protected). To make your first comment (reply), where it invites you to log-in or register, you need to invent and register a personal username as guided by the simple instructions which appear. Soon after, you will receive your own password by email. Record your username and password in a safe place for future use. Note: We carefully guard your email address. We take great care not to display email addresses on the web site, and so should you when using this blog facility. To avoid anyone being deluged by spam, simply never advertise anyone’s email address.